People in a number of US-allied nations trust Vladimir Putin more than Donald Trump when it comes to handling foreign affairs, according to a new survey. The results show a significant lack of confidence in both leaders. Respondents in US allies such as Japan, South Korea and seven European NATO members – Greece, Germany, Turkey, Hungary, France, Italy and Spain – which have historically relied on the US for military support and defense, all expressed more confidence in Putin. 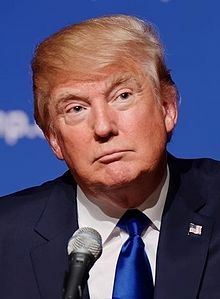 One reason for this may be the erratic comments Trump has made on world issues since he entered office in January – questioning the validity and effectiveness of NATO, delaying affirmation of the alliance’s mutual defense pact, and accusing members of not pulling their weight. The above news post also had a link to a video titled “Trump: Nightmare for Europe?” So, I watched that video. Some consider that Donald Trump is a “loose canon” that makes claims, but “he doesn’t know anything.” Furthermore, “Trump doesn’t know anything about Europe.” Some believe that Donald Trump is presenting Europe with a reason to unite. It was stated that Donald Trump is just the face of many Americans who want US dominance of economics and other matters above Europe. At the end of the video one said Donald Trump was a nightmare, one said he was not sure, and another said he was not a nightmare as he would lead to greater unity in Europe. Biblically, European unity will be a nightmare (cf. Revelation 13; Matthew 24:21-22; Daniel 11:39-44). Donald Trump has been a factor in getting Europe to more seriously consider greater unity. But it is not just actions/statements by Donald Trump. The sanctions pushed through by the US Congress, that Donald Trump opposed, are driving Russia and Europe closer together, not farther apart, as was supposedly the intent. Today, Europe supplies “many luxury goods” and Russia is a major trader of commodities such as oil and gold. It also exports copper, which is the major component of bronze. More on the origins of the Russians can be found in the article: Russia and Ukraine: Their Origins and Prophesied Future. Thus, Russia is prophesied to attain wealth from the coming restored European Empire, but it will not then be the most powerful block of nations in the world. Consider also that back in January 2015, German Chancellor Merkel proposed discussing a European Union/Eurasian trade zone (see Merkel’s European-Eurasian Trade Zone Proposal). Germany often dominates the European Union, whereas Russia does dominate the Eurasian Union. Now with the latest sanctions’ bill, they both are probably more motivated to work closer together. The Europeans and Russians have been openly discussing ideas, for years, to cut the United States out. Donald Trump and the sanctions bill are giving the Europeans more reasons to work with Russia against the USA. Germany’s Adolf Hitler and the then Soviet Union’s Joseph Stalin made a deal together which helped pave the way for World War II. The time will come when the Europeans and states in North Africa and the Middle East make a deal paving the way for World War III(WWIII) such as is described in Psalm 83. It is also likely that the Russians and others in Asia will also make some type of deal with the Europeans related to WWIII. The end of the United States is coming according to biblical prophecy (e.g. Daniel 11:39; USA in Prophecy: The Strongest Fortresses). And later, so also will the cooperation between the Europeans and Russians end, according to biblical prophecy (e.g. Jeremiah 50:41-43). Europe itself will unite. The Pew poll shows that European distrust of Donald Trump is helping push Europe away from the USA. Radio News Reporter: Jay Chang.